It is equipped with 2.4″ high-resolution LCD. Compact size, low power consumption. 1 x Car DVR. IR Night Vision. LED Night Vision Support: 1 infrared LED. Image Sensor: CMOS. Automatically turn on/off function. 1 x Fuse Blade Box Holder w/ Cover. Our fuse block has negative ground connections (1x ground input and 6x ground outputs) for superior functionality. per fuse block. -LED indicator displays circuit issues. POWER CONNECTOR. - Battery plug, jump leads, auxiliary batteries – motorsports, boats, trucks, forklifts. （Large size - Red）. 2 X interconnecting halves (Red). Part Number:EB802. Listed Part number: EB802. You shall receive a EB802. Product Range: Excell. Part Manufacturer: Exide. Content: 1x Battery. Warranty: 3 Years. Hold Down Type: B13. For use with systems under 60 volts. Selector Position: ON - OFF. - Widely used for Car, Marine, Boat, RV, Camper, Truck, ATV, UTV, Battery banks and other 0-60V Devices. 1 x Battery Switch. 4 x Side Pads. Transparent case of fuse, quick check and replace the fuse. 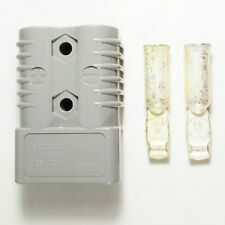 Model: Standard Blade Fuse. Fuse Size: 18.5mm x 18mm. 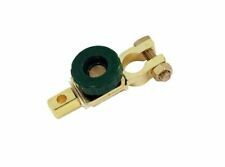 1 pcs x Fuse Puller. General color and type marks, help quick match and fixing. 10pcs x 35 AMP Purple. 20 piece 30amp. With RECTANGULAR SHAPED ENDS, as shown on the listed image. Supplied in carry case. 20 piece 5 amp. STRICTLY NO PICK UP AVAILABLE. 20 piece 10amp. Bag of 36 Mixed Amp Standard Blade Fuses. Quantity: 36. Variety of automotive uses, used in. UK Fast Shipping !! Night Vision!! G-sensor!! 1080P!! CONVENIENT DETECTION: The plug-in blade fuses are made from transparent PES with zinc alloy inserts and transparent housings for viewing the fuse link status and quick detection of a blown fuse. 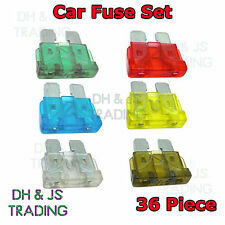 2 AMP Car Fuse: 10pc. Selector Position: ON - OFF. - Widely used for Car, Marine, Boat, RV, Camper, Truck, ATV, UTV, Battery banks and other 0-60V Devices. 1 x Battery Switch. 4 x Side Pads. - Heavy-duty design, High-quality. 1 x Fuses Puller. Each fuse size: 20×6×21 MM (L× W× H), 10 different fuses a tool that include 3,5,7.5,10,15,20,25,30,35,40. The blade fuses are made from premium zinc alloy, ROHS compliant, with a transparent cover to protect your vehicles from short circuit and overload, used for most autos. Finish : Copper. KW1-KW17, PA20-PA38, PA41-PA49, PA60-PA78, PH4-PH44, PH49-PH50, PO (Isle Of Wight) TR (Isles Of Scilly) ZE (Channel Isles). Fits Up To 12mm Cable. Battery plug, jump leads, auxiliary batteries – motorsports, boats, trucks, forklifts. - Light and durable polycarbonate housing. 1 x Battery Isolator Cut Off Power Kill Switch. 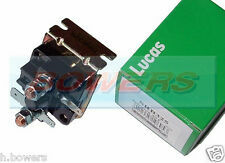 Suitable for both 12v and 24v. Material Type: plastic. Item Type: Switches. 200 Amp Normal - 24 VDC. 400 Amp Normal - 12 VDC. Each fuse size: 20×6×21 MM (L× W× H), 10 different fuses a tool that include 3,5,7.5,10,15,20,25,30,35,40. The blade fuses are made from premium zinc alloy, ROHS compliant, with a transparent cover to protect your vehicles from short circuit and overload, used for most autos. Colour: Grey. 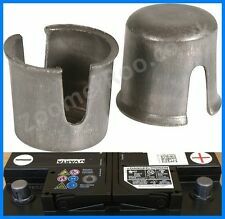 Suitable for auxillary batteries, jump leads, battery plug, forklifts, boats, wheelchairs, trucks, electrical vehicles etc. Current: 50 amp. 500a for 5 seconds. Battery Isolator Switch Spare key. High quality, two keys in total. Easy operation: disconnect and reconnect battery by one simple turn of the knob on it. -Effective to solve theses problems: electric leakage and loss of electricity. The star-scores are very important to us. SAME DAY DISPATCH ORDER BEFORE 12PM! 3 KEYS. POWER CONNECTOR. （Large size - GREY）. - Battery plug, jump leads, auxiliary batteries – motorsports, boats, trucks, forklifts. 2 X interconnecting halves (Grey). (dust cover not included). Battery plug, jump leads, auxiliary batteries ?. motorsports, boats, trucks, forklifts. - Light and durable polycarbonate housing. Part Number:EB451. Listed Part number: EB451. You shall receive a EB451. Product Range: Excell. 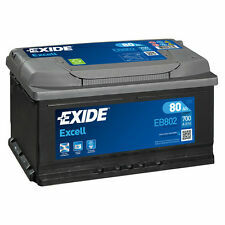 Part Manufacturer: Exide. Content: 1x Battery. Warranty: 3 Years. Hold Down Type: B1. To engage power just hand tighten the green knob, Slightly loosen the green knob to disconnect all power. We hope that you will join them! COLLECTION IN PERSON. Universal Battery Master Isolator Switch Cut Off Heavy Duty Power Kill Key 12V. 1xBattery Isolator. 2x handle key. Installing hole space: 12mm. 1x Battery Master Isolator Cut Off Kill Switch. Suitable: all Vehicles 12v and 24v, Also ideal for use in MOTORSPORT. 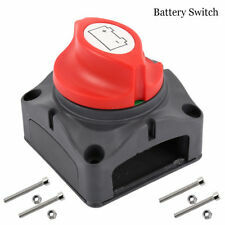 This heavy duty battery cut off switch, It can simply remove the red key to dissconnect the battery. This switch is easy to install and its instantaneous current can be 1000A, rated current is 600A. This switch can widely applied to Car, Boat, Van, Truck, RV, Motorcycle, and etc. - The instantaneous current can be 1000A, rated current is 600A. Instantaneous current: 300A. Easy operation: disconnect and reconnect battery by one simple turn of the knob on it. Wide applications 12V - 60V batteries: Car, Van, Boat, Rv, Truck, etc. Working temperature: 80° or less. 3 Way Components is based in Luton, Bedfordshire, England. Mate N Lok. Relay Holders Bases. Relay Holders and Bases. Lucas Rists TTS Range. Waterproof Boots and Covers. Positive & Negative - Pair. Depth: 26mm. POWER CONNECTOR. - Battery plug, jump leads, auxiliary batteries – motorsports, boats, trucks, forklifts. （Small size - Red）. 2 X interconnecting halves (Red). 12/24v UNIVERSAL MALE DIN PLUG. Brass & Gold plated connections. 57mm x 22mm. 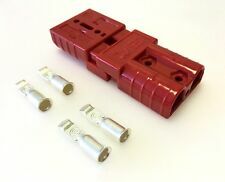 Genuine 30amp Anderson Powerpole connectors. Kit car builds. 10 X Interlocking plugs (5X Red and 5XBlack ). 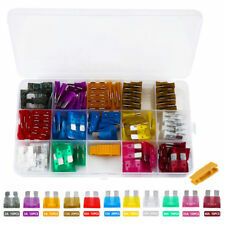 Box of 120 Assorted Mini Blade Fuses. 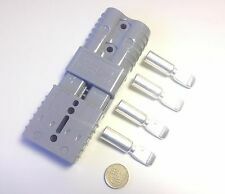 Great quality mini blade fuses. 1 pcs fuse puller. These can be used in cars, vans, tractors, quads, lawnmowers, HGV's, plant machinery etc. We are always making efforts to providing better products and service. 500a for 5 seconds. Battery Isolator Switch Spare key. 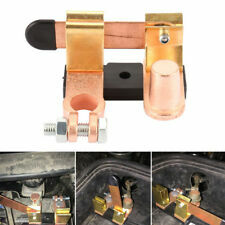 1 Car Battery Isolator Disconnect Cut OFF Power Kill Switch. Item Type: Power Kill Switch. Waterproof cover can better protect key hole. withstanding current of this battery switch: 24V 400A. 1 x 12/24V 300A 3 Way Power Distribution Box Complee with 3 x M8 Stud Bolts. · Max Current – 300A Peak. 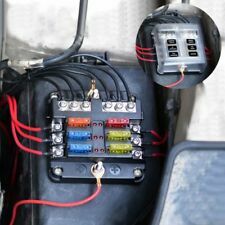 Genuine High Quality 12 / 24V 300 AMP 3 Pin / Way Bus Bar Power Junction Connector Box Complete With 3 x M8 Stud Bolts - Automotive & Marine. It is equipped with 2.4″ high-resolution LCD. Compact size, low power consumption, it is the best choice for your car. 1 x Car DVR. IR Night Vision. LED Night Vision Support: 1 infrared LED. Automatically turn on/off function.